The central government has cleared projects and schemes totalling Rs 31,000 crore to boost investment in the languishing power sector. The Cabinet Committee on Economic Affairs (CCEA) approved two thermal power and two hydropower projects, a hydropower scheme and a revival scheme for stressed assets on Thursday, probably the last Cabinet meeting before the Lok Sabha elections. Hydropower has been devoid of investment for a decade. In this segment, any projects above 25 Mw in capacity would now come under the category of renewable energy. This would entail a hydro power purchase obligation on states and get it priority status. With this, India would achieve one of the targets it has committed to under the global climate change treaty for reducing of emissions — sourcing 40 per cent of its total energy consumption from renewable sources. R K Singh, minister of state for power and new & renewable energy, said budgetary support would be provided for allied infrastructure of hydro power units, to contain the cost. “Budget support for funding cost of the flood moderation component, enabling infrastructure such as roads and bridges, would be given on case to case. This would be limited to Rs 1.5 crore per Mw for up to 200 Mw projects and Rs 1 crore per Mw for above 200 Mw projects,” he told reporters. Business Standard reported recently that the Centre was aiming to reduce the cost of hydropower during the construction period through budget support. Also, to promote and incentivise hydro power as 'peaking power', to balance the increasing share of solar and wind energy in the national grid. Among other measures for hydro, the project life has been increased to 40 years, thereby also increasing the debt repayment period to 18 years. The policy also allows for a two per cent yearly escalation in rates. “We have discussed with all the banks and they have agreed to the extended period of debt payment. We want to reduce the cost of hydro power in the initial years of operation,” said Singh. The Cabinet also sanctioned two investment proposals in hydro power units. The Kiru hydro electric project of 624 Mw, at an estimated cost of Rs 4,288 crore, was approved. 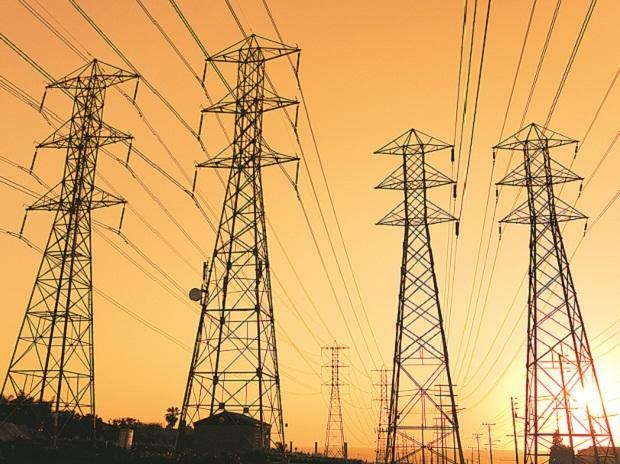 The project is to be executed by Chenab Valley Power Project, a joint venture company of government-owned NHPC, Jammu and Kashmir State Power Development Corporation and PTC India. Teesta Stage-VI in Sikkim was also approved, to be bought by NHPC. The project was being developed by Lanco Teesta Hydro Power Ltd, promoted by the Lanco Group. Due to the company's financial difficulties, the project was not completed and the insolvency law was invoked; NHPC emerged the highest bidder, with Rs 907 crore. The investment proposal for an estimated Rs 5,748 crore was approved by the CCEA. Stressed assets in the power sector are about 40,000 Mw. On these, the recommendations of a Group of Ministers (GoM) constituted to examine the suggestions of a High Level Empowered Committee (HLEC) were approved. The HLEC was chaired by the cabinet secretary, to provide a long-term solution. Among the HLEC recommendations approved were grant of linkage coal for short-term power purchase agreements (PPAs). And, for allowing the existing coal linkage to be used in case of a PPA termination due to a payment default by the distribution company (discom) concerned. To improve coal availability for power units, an increase in the quantity for special forward e-auction for the sector was allowed. The Cabinet also allowed coal linkage auctions to be held at regular intervals. Also, for procurement of bulk power by a nodal agency, against pre-declared linkages. The HLEC had recommended NTPC act as an aggregator in procuring, through a transparent and competitive bidding process from stressed power plants. It can then offer that power to discoms against the PPAs of NTPC, till such time its own plants/units are commissioned, went the report. “Any PPA, fuel supply agreement or regulatory approvals would remain unchanged even after the project changes hands post NCLT (the insolvency process). We hope that with these recommendations, many of the issues of the thermal power sector would get resolved,” Singh said. The CCEA approved a proposal by THDC Ltd to set up a 1,320 Mw super-thermal plant at Khurja, Uttar Pradesh, for about Rs 11,000 crore. 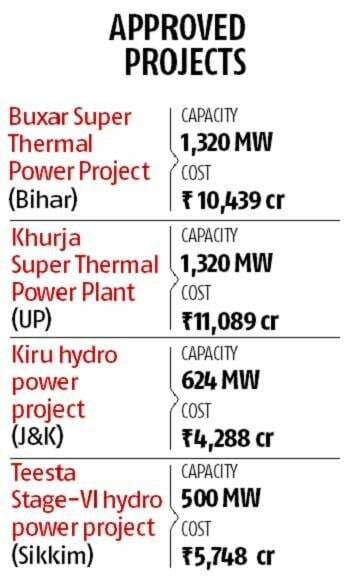 And, a 1,320 Mw thermal power projct at Buxar in Bihar, for about Rs 10,400 crore. The plant will be set up by SJVN Thermal, a wholly owned subsidiary of SJVN. Both projects are to be commissioned by 2023-24, to cater for the increased power demand in both states.